Frederick, MD -- Visit Frederick has just launched a new bicycling video showcasing the many cycling opportunities available throughout Frederick County. The county’s unique geography has a variety of terrain creating rides suitable for all skill levels and for different kinds of cycling, from road biking to mountain biking to a leisurely ride around town. The new video shows why Frederick County is the ideal location for cycling enthusiasts to visit. The short video, just over a minute and a half in length, features the song, “Bike Ride” recorded by Nora Jane Struthers & The Party Line, and shows cycling through covered bridges in northern Frederick County, cycling in Baker Park, road biking throughout the county, mountain biking at Gambrill State Park, biking along the C&O Canal and at a local winery. It also includes footage from annual cycling events in Frederick County like the Clustered Spires High Wheel Race, the only race in America of its kind, Bike to Work Day, and the downtown Frederick Christmas bike ride done every year at night with festive lights and holiday decorations. The video is hosted on YouTube and was produced by Digital Bard, a firm located in downtown Frederick specializing in marketing videos. It can be viewed on the VisitFrederick channel at www.youtube.com/visitfrederick or at the URL https://www.youtube.com/watch?v=2mznLLBXxVk. Bicycling has been and continues to be a tourism draw for visitors to Frederick County and the City of Frederick, which has been designated as a Bicycle-Friendly Community by the League of American Bicyclists. 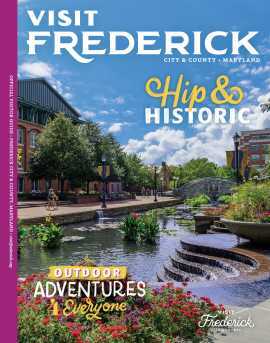 The Frederick Visitor Center has two brochures that cater to cyclists, the Frederick History Bicycle Loop and Heritage Bicycle Tours brochures. The Frederick History Bicycle Loop is a 10-mile loop through the City of Frederick with stops at 22 sites. Most of the sites have ties to Frederick’s rich history, from Schifferstadt Architectural Museum to the Hessian Barracks to the Francis Scott Key Memorial and Civil War sites. It takes at least two hours to complete or it can be spread out over an entire day of exploration through Frederick’s 50-block historic district. The Frederick County Heritage Bicycle Tours brochure outlines five distinctly different tour routes throughout Frederick County, each offering unique experiences exploring themes like Civil War history, transportation heritage, covered bridges, and more. This month, in conjunction with the 3-day Tour de Frederick, the City of Frederick celebrates its history and love of bicycles with the Clustered Spires High Wheel Race. The unique race begins in front of Brewer&apos;s Alley, at 4:30pm and features riders dressed in vintage clothing. It is a one-hour, multi-lap race along a 0.4 mile route through downtown Frederick, Md., that always draws a crowd.